We all need to eat.Cooking your own food is a good way to get a meal onto the table or wherever you choose to eat. Some people enjoy preparing food. They like to read recipes, talk to others about food and watch television cooking programs. They enjoy experimenting and trying something new. Other people would prefer another household member take care of cooking or they like to eat out or grab takeaway. There are people who use a recipe as a guide but make a change or two to suit their own taste. Others follow recipes carefully and don't change a thing. My grandmother was a great cook and prepared tasty meals and baked fantastic cakes and biscuits. She was well known locally for her 'kuchen' (German cake). When asked for the recipe Grandma had a problem because she didn't have one written down. She just 'knew' how much of each ingredient to use and so she would say. 'you know, just enough,' when asked for the quantity of a particular item. Sometimes people thought she was trying to keep her recipe a secret. For some things I use a recipe but there are times when I make soup and stews with whatever is in the fridge and pantry. I will 'taste test' as I go along and add more herbs or spices or whatever seems to be needed. This means I can't make the meal exactly the same the next time. Today there are so many recipes available in books, magazines, on television and online. Although I usually cook something I am familiar with, sometimes I find a new recipe, probably on the internet, that I decide to try out. Cooking is something we can all relate to and makes for some great comedy. That could be in the way of a sitcom, a cartoon or a gif. 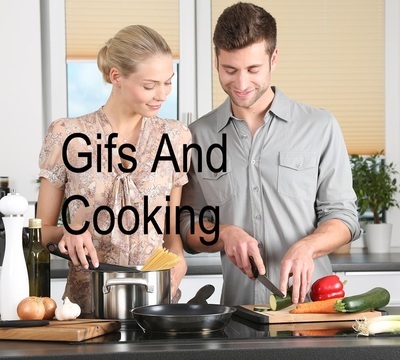 Some gifs are just so cute. Do you like to cook or would you rather someone else do it?